This spiral-bound activity book contains 20 reusable picture pages filled with color, packed with cheery details, and ALMOST complete: All that's missing are colorful tape strips to fill the empty white stripes, dashes, spokes, and more! Kids can pull, press, and tear four rolls of color tape to add the laces on a shoe, stripes on a zebra, blades on a helicopter, ties on a train track, and much more--there are 20 pictures in all to complete and embellish. 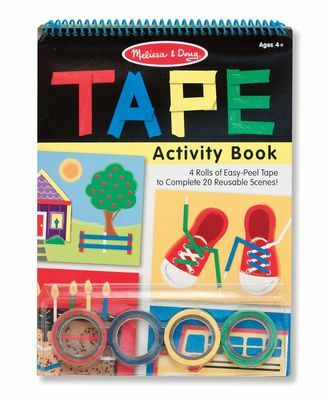 Beneficial for fine motor skills, finger strength, hand-eye coordination, color recognition, and great for travel too (tape stores right in the cover! ), this engaging kids' activity book is a colorful and creative way to build basic skills and a sense of accomplishment!